SBIFF 2018, photo courtesy Santa Barbara Vintners Foundation. Guests at the 34th annual Santa Barbara International Film Festival (SBIFF)—which runs from Wednesday, January 30 through Saturday, February 9 in downtown Santa Barbara—will get an extra warm welcome from our local winemakers. Santa Barbara Vintners Foundation is sponsoring the festival and providing wine at nightly Filmmaker’s Happy Hours and post tribute Studio Parties from member wineries, including Au Bon Climat, Brander Vineyard, Brewer-Clifton, Brick Barn Wine Estate, Cambria Estate Vineyards, Folded Hills, Hitching Post Wines, Mail Road Wines, Margerum Wine Company, Nielson Winery, Pence Vineyards & Winery and Temperance Cellars. “This is the second year the Vintners Foundation has sponsored SBIFF and we are proud to continue our support for this showcase for filmmaking and the community education programs that SBIFF organizes throughout the year for local students,” says Katy Rogers, president of Santa Barbara Vintners Foundation, the charitable umbrella under which Santa Barbara Vintners conducts its philanthropic work. At the Opening Night Gala on Wednesday, January 30 in Paseo Nuevo, the wines of Brewer-Clifton, Cambria Estate Vineyards and Nielson will be served. The Gala follows a showing of the film Diving Deep: The Life and Times of Mike DeGruy at the Arlington Theatre. 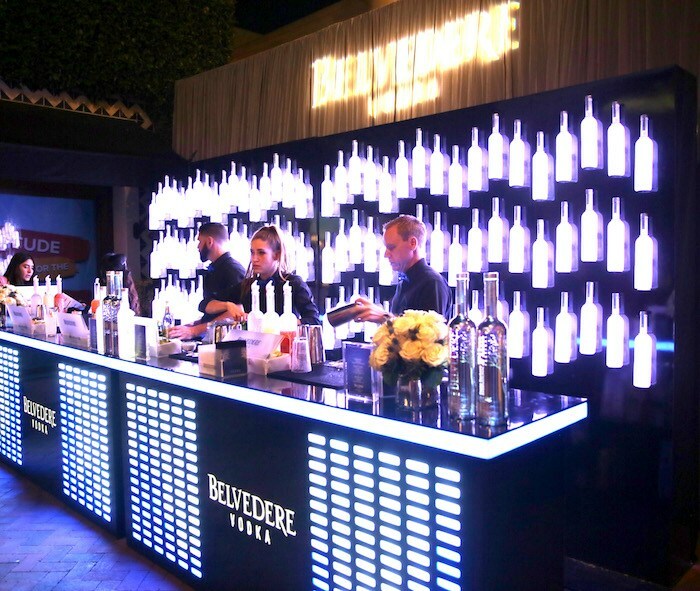 Belvedere Vodka bar at SBIFF 2018. Photo by Rebecca Sapp/Getty Images for SBIFF. Belvedere Vodka will also be on hand as the sole liquor sponsor of the 34th annual festival, serving signature cocktails like the Belvedere Classic Martini and Belvedere Expresso Martini, among others. Belvedere is the official sponsor of the Cinema Vanguard Award honoring Michael B. Jordan on February 7, where the brand—named “Vodka Producer of the Year” three times in a row by the International Spirits Challenge—will spotlight its “Beautiful to see. Beautiful to experience.” campaign. Tickets for all festival events and film screenings, are available at sbiff.org. Hope to see you there. Cheers! Click here for more cocktail corner columns. Originally published in Santa Barbara Seasons on January 30, 2019. Once again, the beautiful Riviera Park will host the 37th annual Taste of the Town Santa Barbara benefitting the Arthritis Foundation on Sunday, September 9, from Noon-3 p.m. Courtesy photo. 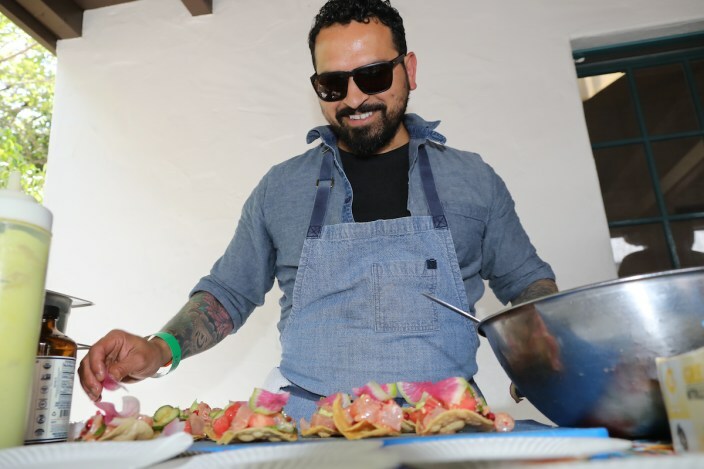 The Taste of the Town Santa Barbara Weekend features two signature culinary events, so why not eat and drink to your heart’s content on September 7 and 9! First up is Taste of the Town Santa Barbara Connoisseurs’ Circle Gala Dinner on Friday, September 7, at Hilton Santa Barbara Beachfront Resort. At this VIP tasting event with a select group of Taste of the Town wine and beer partners, guests will enjoy appetizers, as well as a four-course gourmet dinner prepared by 2018 Honorary Chefs Matt Johnson (San Ysidro Ranch), David Rosner (Monarch at the Montecito Inn), Steven Giles (formerly of Sage & Onion and Le Gavroche London), David Cecchini (Cecco Ristorante), and a guest chef from Hilton Hotels & Resorts. Taste of the Town’s 2018 Honorary Vintner is Jim Clendenen of Au Bon Climat, courtesy photo. The evening takes place in the beautiful oceanview Rotunda and includes special wine pairings from 2018 Honorary Vintner Jim Clendenen of Au Bon Climat. In addition, guests will have the opportunity to meet 2018 Youth Honoree Shannon Morehouse and 2018 Honorary Artist Chris Potter, and enjoy a live auction and dancing under the stars. Seating is limited so advance reservations are highly recommended. Sunday, September 9, brings yet another opportunity to indulge for a good cause. The popular Taste of the Town Santa Barbara features unlimited samplings from the area’s finest restaurants, caterers, wineries, breweries and spirits providers, with a silent auction of lifestyle items, photo booth and live jazz entertainment by the David Tovar Trio. 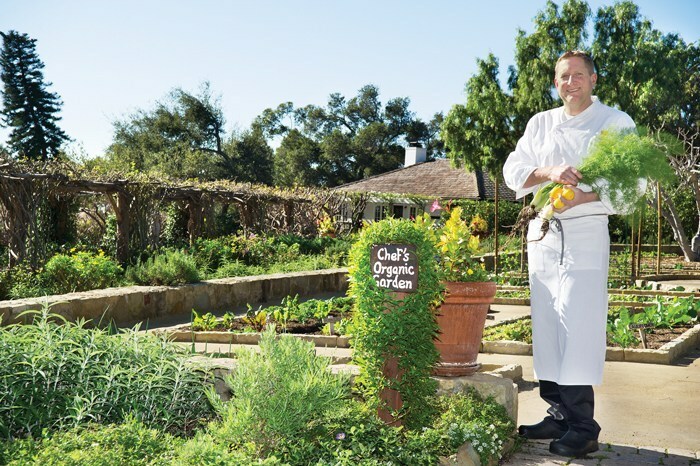 One of the 2018 Taste of the Town Honorary Chefs is Matt Johnson, executive chef at San Ysidro Ranch. SB Seasons file photo by Amy Barnard. Confirmed food purveyers include: Ca’Dario, Chefs on a Mission, Country Catering, Finch & Fork, Finney’s Crafthouse, Flightline, Green Table, High on the Hog Catering, Lilac Patisserie, Michael’s Catering, Mizza Artisan Pizza, opal Restaurant & Bar, Pascucci’s, Santa Barbara Yacht Club, SBCC Culinary, The Little Door, The Little Kitchen, The Nook, The Nugget Goleta, The Palace Grill, The Secret Ingredient and Via Maestra 42. Confirmed wine, beer and spirits purveyers include: Alexander & Wayne, Alma Rosa, Arthur Earl, Artiste, Au Bon Climat, Brander, Brewer-Clifton, Cutler’s Artisan Spirits, Demetria Estates, DV8 Cellars, Gainey, Giessinger, Grassini, Islands Brewing Company, Jaffurs, Ken Brown Wines, Kessler-Haak, Margerum Wine Company, Melville, Presqu’ile, Qupe, Refugio Ranch, Roblar, Temperance Cellars and Whitcraft Winery. It all takes place from noon-3 p.m. at Riviera Park, 2030 Alameda Padre Serra, Santa Barbara. Taste of the Town’s confirmed wine, beer and spirits purveyers include: Alexander & Wayne, Alma Rosa, Arthur Earl, Artiste, Au Bon Climat, Brander, Brewer-Clifton, Cutler’s Artisan Spirits, Demetria Estates, DV8 Cellars, Gainey, Giessinger, Grassini, Islands Brewing Company, Jaffurs, Ken Brown Wines, Kessler-Haak, Margerum Wine Company, Melville, Presqu’ile, Qupe, Refugio Ranch, Roblar, Temperance Cellars and Whitcraft Winery. Courtesy photo. All (yes, ALL) proceeds from Taste of the Town Santa Barbara support the programs and services of the Arthritis Foundation. The Foundation is the only nonprofit organization dedicated to improving the lives of 50 million people (including nearly 300,000 children) with arthritis through health education, advocacy, research, and local juvenile arthritis support. Tickets are available at www.arthritis.org/tasteofthetownsb or by calling the Arthritis Foundation Central Coast at 805/563-4685. Hope to see you there! Cheers! Click here for more Cocktail Corner columns. Originally published in Santa Barbara Seasons on August 17, 2018. Santa Barbara Wine + Food Festival 2018, courtesy photo. 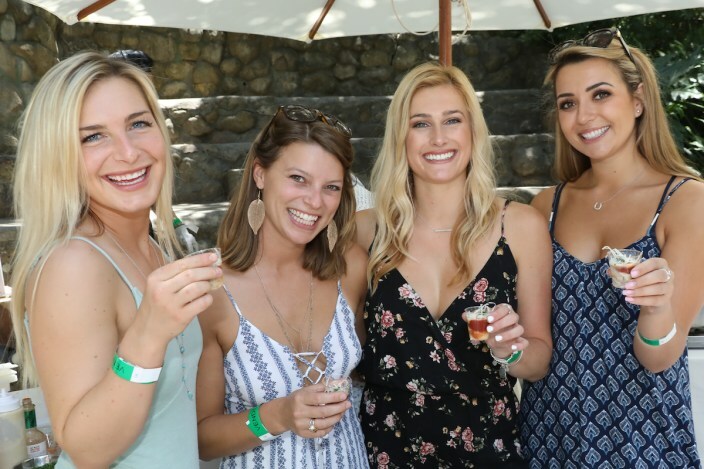 One of the very best wine fests—the 31st Annual Santa Barbara Wine + Food Festival—returns to the Santa Barbara Museum of Natural History on Saturday, June 30. The Museum is a beautiful place to indulge in delicious wines paired with excellent bites along the shaded banks of Mission Creek. And you can feel good about going to this event because all net proceeds from the festival support the Museum’s nature and science education programs. I have fond memories of field trips to the Santa Barbara Museum of Natural History back when I was in elementary school, as well as many more recent trips with my son. It’s definitely a festival with a LOCAL feeling. 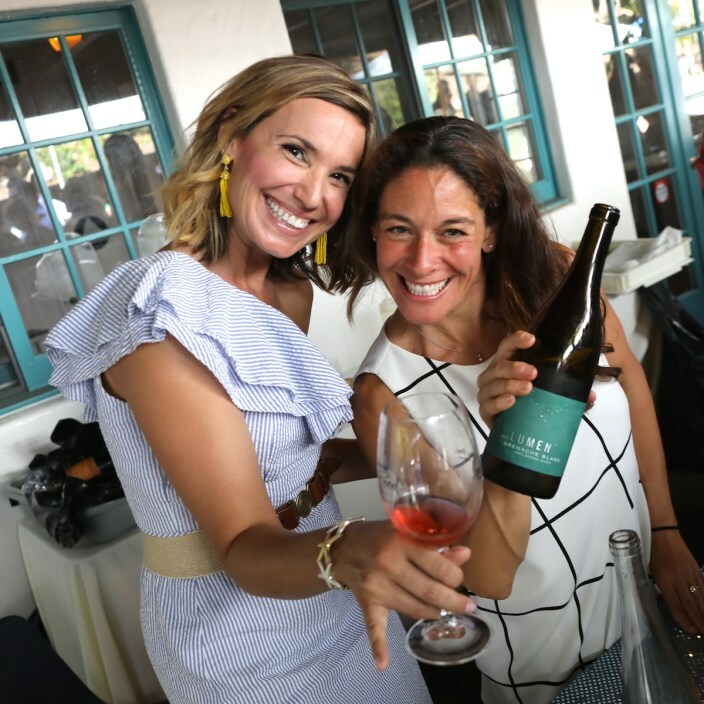 Perhaps because of that, the Santa Barbara Wine + Food Festival is also one of the few events that the winemakers themselves attend and pour their favorite vintages. “This is one of the very best tastings that we attend throughout the year,” says Richard Sanford of Alma Rosa. “This is the most beautiful tasting, the most beautiful setting that I do anywhere in the country.” says Jim Clendenen of Au Bon Climat. Jamie Slone at Santa Barbara Wine + Food Festival, courtesy photo. Marni Margerum at Santa Barbara Wine + Food Festival, courtesy photo. 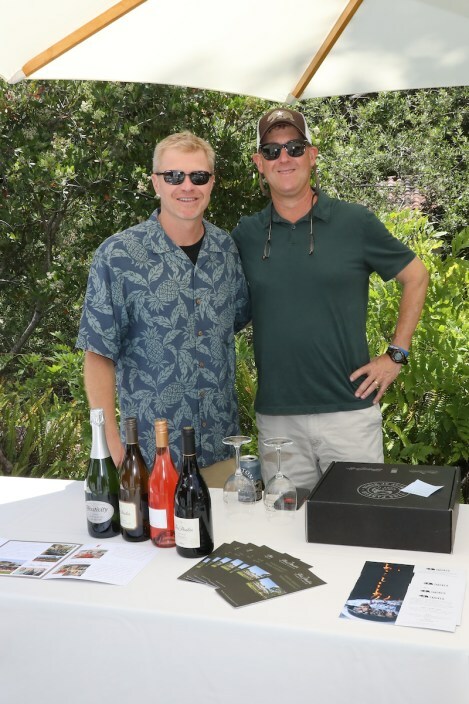 Tim Snider and Brad Thomas at Santa Barbara Wine + Food Festival, courtesy photo. 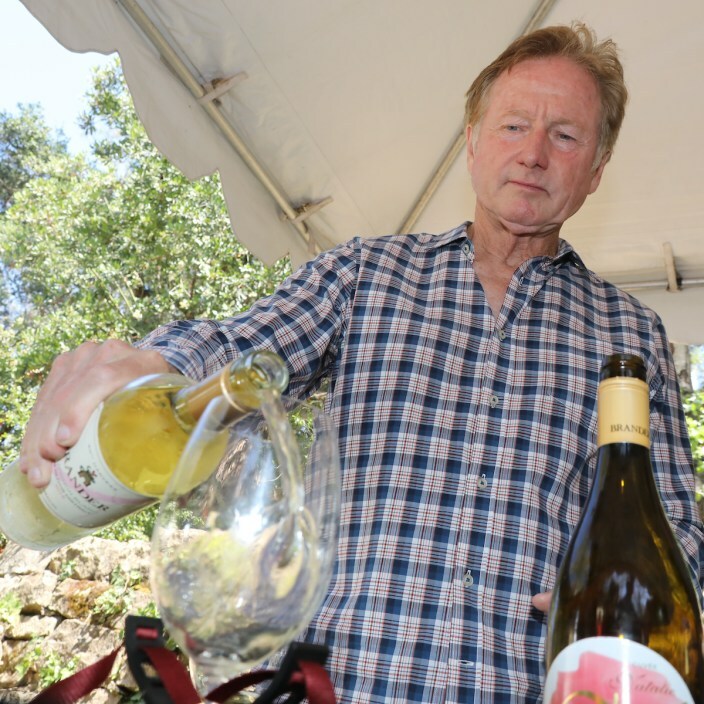 Fred Brander at Santa Barbara Wine + Food Festival, courtesy photo. Courtesy Santa Barbara Wine and Food Festival. Ian Cutler at Santa Barbara Wine + Food Festival, courtesy photo. 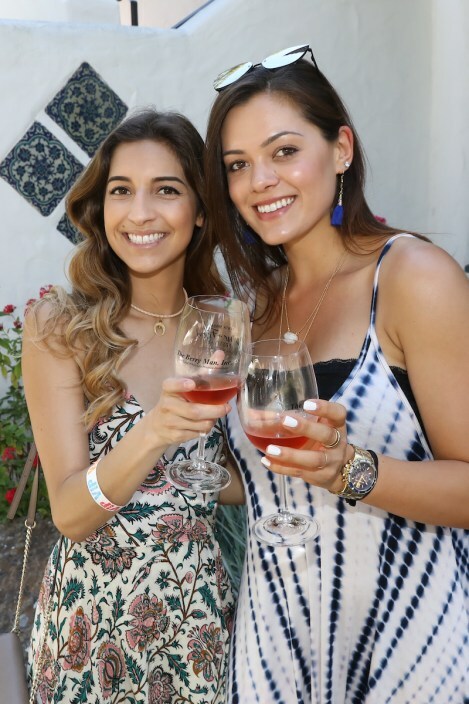 Guests enjoy Santa Barbara Wine + Food Festival, courtesy photo. • Santa Barbara Popcorn Co.
Santa Barbara Wine + Food Festival tickets cost $75 for Museum members and $100 for non-members. VIP tickets, including access to the VIP Lounge, early entry at 1 p.m. (the regular festival runs from 2–5 p.m.), six exclusive tastings and food pairings with winemakers, chair massages, and more are $125 for Museum members and $150 for non-members. Designated drivers are free to enter as long as they accompany a paid guest. Designated drivers can sign up by emailing Sarah at sclement@sbnature2.org and giving the names of their passenger(s). The Museum is located at 2559 Puesta Del Sol, Santa Barbara. For more information, please visit www.sbnature.org/winefestival. I hope to see some of you there. Cheers! Click here for more Cocktail Corner columns. Originally published in Santa Barbara Seasons on June 3, 2018. Photo courtesy Santa Barbara Wine & Food Festival. 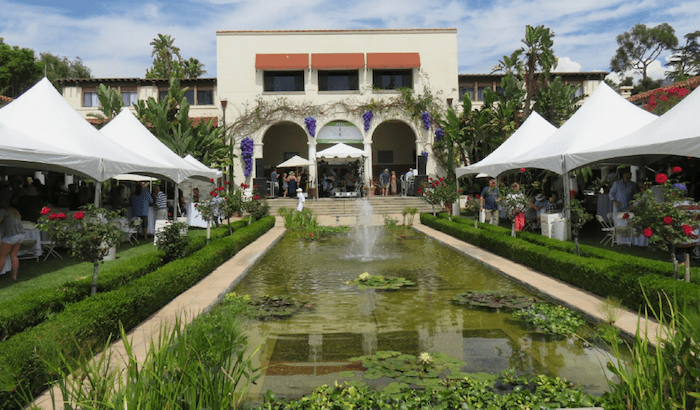 This month marks the 30th anniversary of the Santa Barbara Museum of Natural History‘s beloved wine festival, and they are commemorating the event with a new name—the Santa Barbara Wine & Food Festival—which more accurately reflects the bounty of sips and bites found at this signature fundraiser. 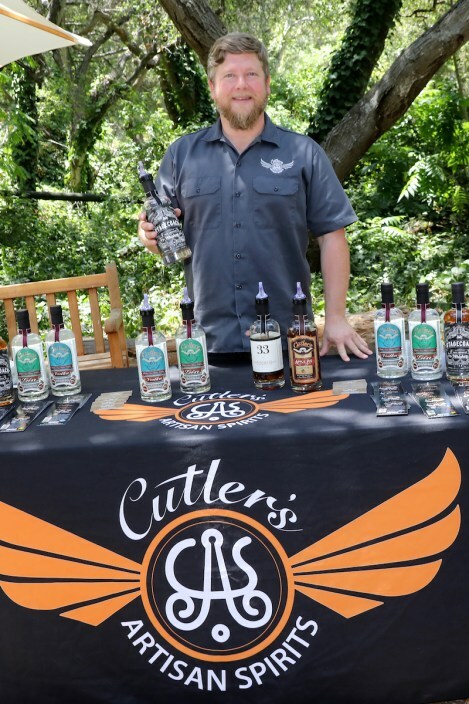 While the food and the wine have always flowed freely at the festival, this year events manager Meridith Moore has set a goal to have 50 food vendors on the roster this year to accompany the 50 wineries. “My hope is that the name change will help to attract even more of Santa Barbara county’s incredible food vendors and highlight the ones that have been participating all these years,” she says. As of press time, food vendors include: Barbareno, Benchmark, Bob’s Well Bread, Brophy Bros., Buena Onda, Ca’ Dario, Coffee Bean and Tea Leaf, Chooket/Your Cake Baker, Corazon Cocina, Country Catering, Farmer Boy, Finch and Fork Restaurant, Gelson’s ~ Santa Barbara, Helena Avenue Bakery, Hippypop, Il Fustino, Industrial Eats, La Mousse, La Sorelle, Loquita, Michael’s Catering, Mr. E’s Freeze, Mulberry Love, Pacific Pickle Works, Pico, Renaud’s Patissiere and Bakery , Slate Catering Co, Solvang Bakery, The Bear and Star, The Berry Man, Tondi Gelato, Via Maestra 42 and Whole Foods Santa Barbara. Flying Goat Cellars, Foxen, Gainey Vineyards, Grassini Family Vineyards, Hilliard Bruce, Jaffurs Wine Cellars, Jamie Slone, Kalyra, Ken Brown Wines, Kenneth Volk Vineyards, Koehler Winery, Kunin, LaFond Winery, Larner Wines, Longoria, Loring Wine Company, Lumen, Margerum Wine Company, Melville, Mosby Winery & Vineyard, Municipal Winemakers, Notary Public Wines, Oreana, Palmina, Point Concepcion, Potek, Pure Order Brewing Company, Qupé, Rancho Sisquoc Winery, Refugio Ranch, Rideau, Sagebrush Annie’s, Santa Barbara Winery, Silver Wines, Spear Winery, Star Lane Vineyard, Sunstone Winery, Tablas Creek, Tatomer, Tercero Wines, Third Window Brewing, Toucan Wines, Transcendence Wines, Vogelzang, Whitcraft Winery and Zaca Mesa. The beautiful grounds of Santa Barbara Museum of Natural History (2559 Puesta del Sol) are a wonderful spot to appreciate being out in nature, and what better way to enjoy a summer weekend than sipping wine underneath the oaks along Mission Creek? Especially when the proceeds go to support the work of the museum. The event takes place on Saturday, June 24. Guests 21 and older may purchase admission on the Museum’s website (www.sbnature.org/winefestival). This event is always a sellout, so if you want to join in the fun, act quickly or you not get tickets. Hope to see you there. Cheers! Originally published in Santa Barbara Seasons on June 2, 2017. Photo courtesy Santa Barbara Wine Festival. The event takes place Jun. 25 at Santa Barbara Museum of Natural History. 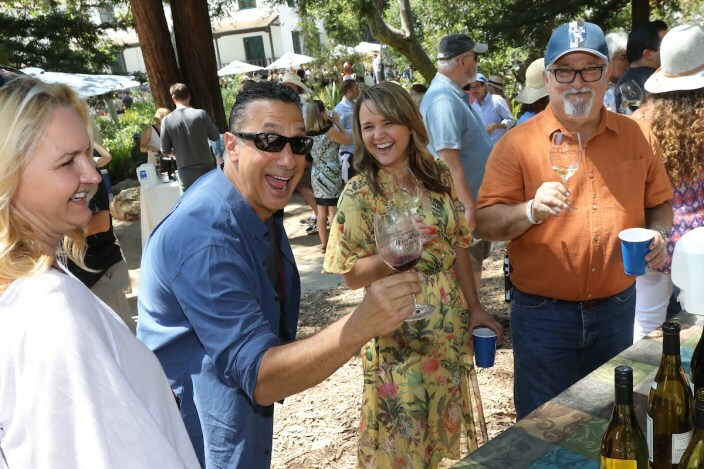 Santa Barbara Wine Festival—the first festival of its kind on the Central Coast—returns for the 29th year, hosted by the Santa Barbara Museum of Natural History (2559 Puesta Del Sol Rd.) on Saturday, June 25 from 2-5 p.m. The beautiful grounds of Santa Barbara Museum of Natural History are a wonderful spot to appreciate being out in nature, and what better way to enjoy a summer weekend than sipping wine underneath the oaks along Mission Creek? Guests will sip, swirl, and savor a variety of wine from 75 wineries complemented by tasty hors d’oeuvres and desserts from famed local restaurants, farm-to-table caterers, and other top shelf food purveyors. They’ll also be celebrating the museum’s 100th birthday with, what else … bubbles! As a commemorative presentation this year, Santa Barbara Wine Festival features Sparkling Way; a special area dedicated to sparkling wines and the perfect opportunity to raise a glass to the occasion. Also, new to the event this year is the VIP Redwood Lounge, where VIP ticket holders can enter the festival one hour early and enjoy a private tasting before everyone else arrives. Winemakers Paul Lato and Morgan Clendenen will be in the VIP Lounge from 1-2 p.m. to pour their world class wines, along with savory bites from Chef Pete Clements. The lounge will also offer access to intimate seating, delectable treats, late , and complimentary chair massages throughout the festival. The Cork Pull raffle is always one of my favorite things at this festival. 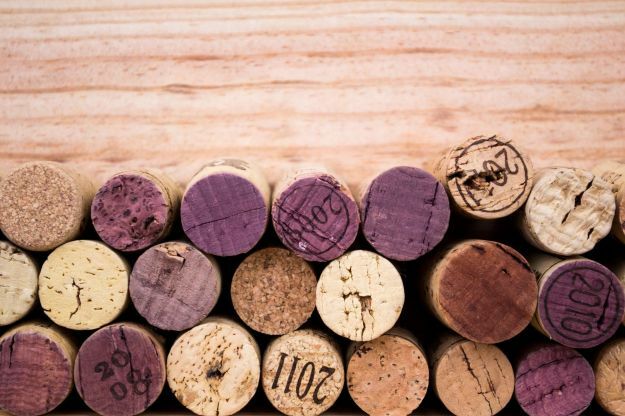 For $30 to pull a cork, participants are guaranteed to win a prize worth at least $30, many of which are terrific wines and other prizes valued at $50 and above. Plus, all proceeds benefit the museum’s exhibits and education programs. Participating wineries include: Alexander & Wayne, Alma Rosa, Andrew Murray Vineyards, Arthur Earl, Au Bon Climat, Babcock Winery, Beckmen Vineyards, Bedford Winery, Blair Fox Cellars, Brander Vineyard, Brewer-Clifton, Buttonwood, Byron, Cambria, Cargasacchi/Pt Conception, Carr Vineyards and Winery, Casa Dumetz, Cebada, Cinque Stelle, CORE, Consilience, Crawford Family Wines, Daniel Gehrs Wines, Dierberg/Star Lane, De Paola Vineyard, Epiphany Cellars, Falcone Vineyards, Feliz Noche, Fess Parker Winery & Vineyard, Fiddlehead Cellars, Flying Goat Cellars, Foxen, Gainey Vineyard, Grassini Family Vineyards, Gypsy Canyon, Jaffurs Wine Cellars and Jamie Slone Wines. Also pouring are:Kalyra, Ken Brown Wines, Kenneth Volk Vineyards, Kita Wines, Koehler Winery, Kunin, LaFond, Larner Wines and General Store, Longoria, Loring Wine Company, Lumen, Margerum Wine Company, Melville, Mosby Winery & Vineyard, Municipal Winemakers, Oreana, Palmina, Potek, Qupé, Rancho Sisquoc Winery, Refugio Ranch, Santa Barbara Winery, Silver Wines, Sunstone Winery, Tablas Creek, Tatomer, Tercero Wines, Toucan Wines, Transcendence Wines, Whitcraft Winery, William James and Zaca Mesa. In addition, participating food vendors are: Barbareno, Benchmark eatery, Brophy Bros., Ca Dario, Country Catering, Coffee Bean and Tea Leaf, Duo, Farmer Boy, Finch & Fork, FreezerMonkey, Il Fustino, Industrial Eats, Jessica Foster Confections, Michael’s Catering, Mr. E’s Freeze, Mulberry Love, Nectar Eatery and Lounge, Pacific Pickle Works, The Stonehouse at San Ysidro Ranch, Via Maestra, Village Modern Foods and Patxi’s Pizza. For more information and to purchase tickets for the Santa Barbara Wine Festival, please visit http://www.sbnature.org/winefestival. Originally published in Santa Barbara Seasons Magazine on June 17, 2016. Downtown Art & Wine Tour, courtesy Downtown Santa Barbara. Art and wine are always an excellent pair, and this year’s 2016 Downtown LIVE Art & Wine Tour is adding a fun new twist to the mix: Live Art! 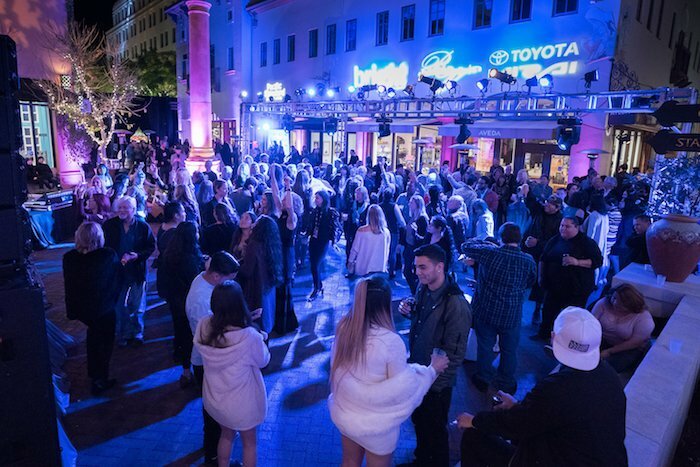 Each of the participating venues north of Carrillo Street—including 10 West Gallery, Bella Rosa Galleries, Churchill Jewelers, Distinctive Art Gallery, Engel & Vӧlkers, Imagine X Functional Neurology, Indigo Interiors, The Painted Cabernet, Santa Barbara Arts, Santa Barbara Public Market and Sullivan Goss – An American Gallery—hosts a LIVE cultural event paired with a Santa Barbara restaurant and regional winery. “Our ingenious venues are exhibiting everything from painting, spinning, live photo development—even aerialists, all performed LIVE,” says Maggie Campbell, Downtown Santa Barbara Executive Director. You can sip from your choice of ten wineries and one brewery along your cultural journey. Participants include: The Brander Vineyard, Buttonwood Farm Winery & Vineyard, Cebada Wine, Fess Parker Winery, Figueroa Mountain Brewing Co, Grassini Family Vineyards, Margerum Wine Company, Presidio Vineyard & Winery, Sanford Winery & Vineyards, Standing Sun Wines, Summerland Winery, Wine + Beer and Windrun Wines. Food offerings included in the ticket price are from: Blush, bouchon Santa Barbara, Brasil Arts Café, C’est Cheese, Ca’Dario, Chase Restaurant & Lounge, Enterprise Fish Co, Finch & Fork, Los Arroyos Mexican Restaurant, Nectar Eatery & Lounge, Nothing Bundt Cakes, opal restaurant and bar, Paradise Café, Pascucci, Patxi’s Pizza, Persona Wood Fired Pizzeria and Viva Santa Barbara. Tickets, which are $65 for the tour and include the Final Party, may be purchased at www.DSBLiveArtWine.Nightout.com, or at the Downtown Santa Barbara office (27-B E. de la Guerra St., M-F, 9 a.m.-4 p.m., check or credit card only). A limited number of tickets are available, so advance purchase is a must if you don’t want to miss out on the fun. For more information, please call 805/962-2098, ext. 804 or visit www.DowntownSB.org. The festivities take place in Downtown Santa Barbara on Thursday, May 26, from 5:30-10 p.m. Hope to see you there! Cheers to art and wine together! Click here for more cocktail corner columns. Originally published in Santa Barbara Seasons Magazine on May 13, 2016. I don’t know if it’s the early harvest, the crazy weather, or just that time of year, but my inbox is bursting with wine news these days. We’re barking about a taste of Verona at the Bacara, Doug Margerum’s new Barden wines, Groundboots charity wine label and Wandering Dog Wine Bar’s new vintages in today’s Cocktail Corner. Bacara Resort & Spa welcomes Fumanelli Winery for an operatic evening by the sea with Verona’s top winemaker, Armando Fumanelli, proprietor of Marchesi Fumanelli Winery. The winery dates back hundreds of years, and in that spirit, the Bacara is partnering with Opera Santa Barbara to enhance the Italian-themed event. Diners will enjoy four Fumanelli wines personally selected by Armando Fumanelli, paired with an elegant reception and three-course Italian-inspired tasting menu by Executive Chef Vincent Lesage. Each course will be preceded by traditional Italian opera performances. The event takes place on Tuesday, September 29, from 6 to 9 p.m. The price is $150 per person. Space is limited and reservations are recommended (It sold out last year). For tickets and additional information, please call 877/496-8977 or visit BacaraResort.com. 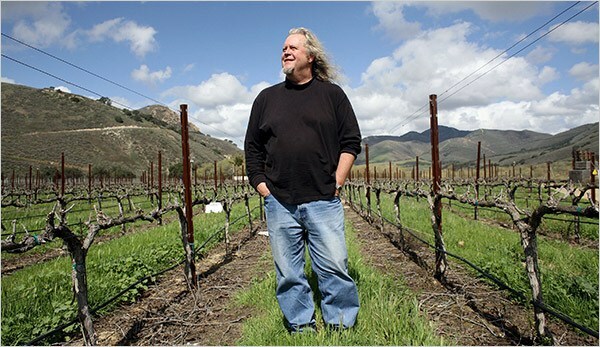 Sometimes I think Doug Margerum must have figured out how to clone himself, he’s such a busy, talented winemaker! Fulfilling Margerum’s dream to create world-class wines using grapes from the renowned Sta. Rita Hills AVA, Margerum Wine Company recently released its new Barden label wines: Chardonnay, Fonte, Syrah and Pinot Noir. Barden is Doug’s middle name and literally translates into “one who lives near the boars den”—a nod also to the wild boars that roam the Sta. Rita Hills. All are available at select wine shops and restaurants, as well as at the Margerum Tasting Room in Santa Barbara and online. The wines retail for $36-$82. For more information on Margerum and Barden wines please visit margerumwines.com. Winemaker Deborah Hall of Gypsy Canyon in St. Rita Hills recently launched Groundboots.org, a wine charity label which is crowdfunding to fundraise for and bring awareness to stopping the illegal dog meat trade through wine. She has designated 100% of profits to go to Soi Dog, an organization that has nearly eliminated it in Thailand, and are now moving into Vietnam, China, Korea, and other places, rescuing and re-homing the survivors. The campaign is running through September. And in case you’re wondering about the “taste good” part of the wine, not just the “feel good” part, this Pinot Noir was hand-harvested from their estate vineyards in Sta. Rita Hills. Cluster sorted at the vineyard, berry sorted at the winery. Aged 18 months in 50% new French oak. More on the intersection between wine and dogs, Solvang’s Wandering Dog Wine Bar—incidentally a very fun, dog- and people-friendly spot—recently expanded its private label wine program from four labels to a current line-up of 14 wines, comprised of eight different, locally-grown varietals. Each of the 14 wines are made by local winemakers/wineries, sourced from local vineyards, and each winemaker/winery is listed on the respective bottle; every winemaker is given full credit for the wines produced for Wandering Dog, in line with the wine bar’s mission to support and foster local vintners–from those just budding to established makers and brands. Wandering Dog’s current releases include a sparkling (’12 “Bentley’s Bubbles”; Norm Yost, winemaker; Santa Maria Valley); ’14 Grüner Veltliner (Graham Tatomer, winemaker; Santa Ynez Valley); ’13 Chardonnay (Kevin Law, winemaker; Santa Maria Valley); ’14 “Mazzey” Viognier (Morgan Clendenon, winemaker; Santa Maria Valley); ’12 “Paige” Pinot Noir (Justin Willet, winemaker; La Encantada Vineyard); ’13 “Leila” Pinot Noir (Norm Yost, winemaker; Rio Vista Vineyard); ’13 “No Leashes” Pinot Noir (Doug Margerum, winemaker; Sta. Rita Hills); ’13 Super Tuscan (76% Sangiovese, 24% Cabernet Sauvignon; Chris Ferrara, winemaker; Paso Robles); ’13 Cabernet Sauvignon (Joshua Klapper, winemaker; Paso Robles); ’12 Zinfandel (Janell Dusi, winemaker; Dante Dusi Vineyard, Paso Robles); and ’12 “Lucy” Petite Sirah (Mark Horvath, winemaker; Viejo Vineyard, Ballard Canyon). 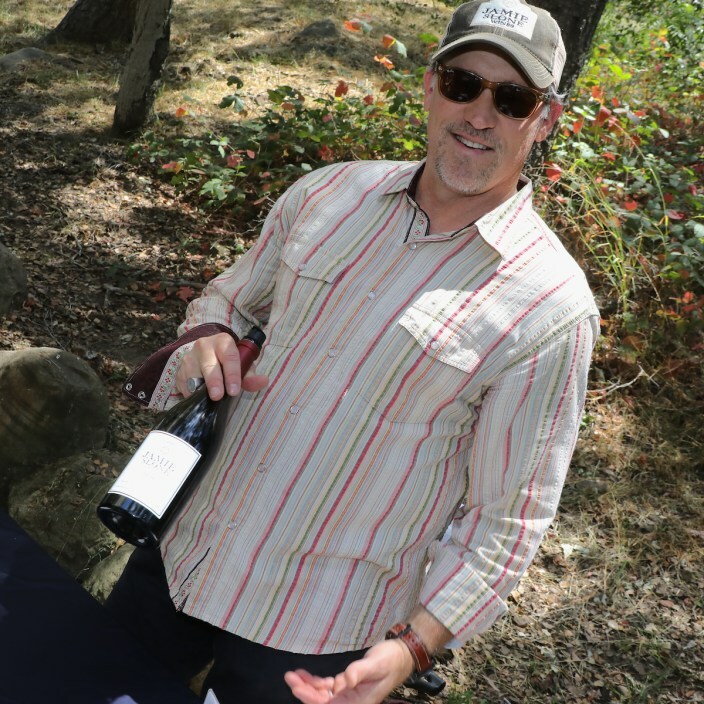 Upcoming releases will include a Syrah by winemaker Michael Larner, from Larner Vineyard grapes (Ballard Canyon). Over the course of its eight years, Wandering Dog Wine Bar has, in addition to international imports, showcased wines from countless winemakers whose own labels were too small to justify the expense of a tasting room. As time passed, many of these producers expanded into their own locations, clearing the way for Wandering Dog to feature the next wave of winemaking superstars. “This cycle has been instrumental in [Wandering Dog’s] success, but has had the side effect of ending professional relationships with winemakers who are more than an account–they are our friends,” says Wandering Dog Wine Bar’s “Director di Vino”, Charles “CT” Williams. Wandering Dog Wine Bar first produced wines in this fashion with a 2005 vintage created by Norm Yost, of California Central Coast wine label, Flying Goat Cellars. Yost’s Pinot Noir, produced for Wandering Dog from Rio Vista Vineyard grapes, was affectionately named “Leila,” for CT’s childhood Newfoundland. Ever since, a good portion of Wandering Dog’s private label listing follows suit with names reflecting family canines of past and present. Now, in 2015, Wandering Dog has burgeoned beyond its “Signature Series” wines with its “No Leashes” program, focusing on popular wineries from past wine lists. Wandering Dog Wine Bar is located at 1539-C Mission Drive (next to Paula’s Pancake House), in Solvang. Originally published in Santa Barbara Seasons Magazine on September 18, 2015. Have you been wanting to check out what’s new on Santa Barbara’s Urban Wine Trail? If so, then the upcoming passport weekend (June 5-7) is your perfect opportunity. weekend long—Friday to Sunday—at all of the 26 tasting rooms. The Passport includes special wine tasting opportunities and complimentary tastings, including the chance to meet winemakers, reserve vintage exhibitions, light bites and live musical entertainment. Passport holders will also get a 10% discount on wine purchases at all member tasting rooms that weekend. Guests begin their wine tasting adventures by picking up their Passport and signature logo glass at any one of the three check-in points, including Carr Winery, Santa Barbara Winery and Margerum Wine Company. The tasting kicks into high gear on Saturday, June 6, from 10 a.m. – 1 p.m. at the Wine Cask restaurant with the Red & White AVA Seminar featuring eight of Santa Barbara’s top winemakers. I went last year and this is a MUST ATTEND event for wine lovers who want to learn more about our region. Guests can sip through and learn about all of the AVA’s in Santa Barbara County. Each of the eight winemakers will share one of their finest wines that represent the AVA where it was grown. Mitchell Sjerven, owner of the renowned Bouchon restaurant, will moderate the seminar and guide guests through each of these unique and notable wines. Last year’s Santa Barbara Urban Wine Trail red and white AVA seminar, photo SB Urban Wine Trail Facebook. Presenting winemakers are some of the most respected names in the business: Margerum Wine Company – Doug Margerum; Santa Barbara Winery – Bruce McGuire; Pali Wine Co. – Aaron Walker; Sanford – Steve Fennell; Carr Vineyards & Winery – Ryan Carr; Jaffurs – Craig Jaffurs; Kunin Wines – Seth Kunin; and Riverbench – Rawley Hermreck. Passport tickets are $75 and AVA seminar tickets are also $75, or you can purchase a VIP All Access ticket for $125, which includes both events. Photo courtesy Santa Barbara Urban Wine Trail. Urban Wine Trail member wineries include: Area 5.1 Winery, Au Bon Climat, Carr Vineyards & Winery, Cebada Vineyard and Winery (inside Isabella Gourmet Foods), Cottonwood Canyon, Deep Sea Tasting Room, Fox Wine Co., Grassini Family Vineyards, Happy Canyon Vineyard, Jaffurs Wine Cellars and Kalyra Winery. Kunin Wines, Lafond Winery, Margerum Wine Company, Municipal Winemakers, Oreana Winery, Pali Wine Co., Riverbench Winery, Sanford, Sanguis, Santa Barbara Winery, Silver Wines, Summerland Winery, The Valley Project (a.k.a. AVA Santa Barbara) and Whitcraft Winery are also on the trail. For more information visit, www.urbanwinetrailsb.com. Originally published in Santa Barbara Seasons on May 29, 2015. The Lark is one of many restaurants offering specials to honor the 30th anniversary of SBIFF. Photo courtesy of The Lark. It’s easy to get the star treatment during the Santa Barbara International Film Festival (SBIFF). As part of a special Film Feast promotion, all sorts of local watering holes and restaurants are offering movie-themed specials during the Film Festival (January 27 – February 7). Get in the mood for a sweep at the Oscars (my prediction) with a Birdman Martini at Ty Lounge at Four Seasons Resort The Biltmore Santa Barbara (1260 Channel Dr.). Made with 10 Cane Rum, Galliano, Gran Gala and lime, I recommend trying this one outside on the patio at sunset. Other specials include an Outstanding Carell Collins and a Cousteau Margarita. All come with an excellent view of Butterfly Beach. The Lark (131 Anacapa St.) also has a special SBIFF Fizz Cocktail made with Cutler’s Gin, Santa Barbara Blood Oranges and Pimm’s. If you prefer wine to cocktails, one of the newer tasting rooms in the Wine Collection of El Paseo, Jamie Slone Wines (23 E. De La Guerra St.) is doing a salute to As Good as it Gets. They’ve partnered with C’est Cheese (Hello? Wine and cheese pretty much are as good as it gets!) to offer $20 wine and cheese pairings, along with screenings of the Jack Nicholson film daily at 1 p.m. and 4 p.m. (pairings are available from noon – 6 p.m. daily). Another great movie—Vino Veritas (“In Wine, the Truth”) —is screening at Margerum Wine Company Tasting Room (813 Anacapa St.), which is in the Wine Collection of El Paseo as well. Also in that same charming paseo is Happy Canyon Vineyard‘s “A Good Year” Tasting Flight One, featuring a Staffords Chocolate Truffle paired with 2013 Happy Canyon Vineyard Sauvignon Blanc, 2011 Happy Canyon Vineyard Barrack Blanc, 2010 Piocho, 2009 Barrack Brand and 2010 Barrack Ten-Goal. The other Wine Collection of El Paseo tasting rooms—Au Bon Climat and Grassini—also have special film fest deals going on, so feel free to make a double- or triple-feature of it. Also down the street at Armada Wine & Beer Merchant (1129-A State St.) is the James Bond Globe Trotter Flight, where you can sample three wines from around the globe, as a tribute to the festival of course! The Pasta Shoppe, in Santa Barbara Public Market (38 W. Victoria St.) has a special $30 prix fixe menu in honor of the 30th anniversary of the Santa Barbara International Film Festival. The special Italian-film-themed menu includes “Under the Tuscan Sun” Insalata dell casa with arugula, shaved red onion, teardrop tomatoes and house made grapefruit vinegrette; plus a choice of: “The Big Night” spinach, Ricotta Gnudi, pomodoro, pecorino; “Lady & the Tramp” bucatini with beef and pork bolognese, fresh herbs and parmigano; or “American in Rome” wild mshroom gnocchi, with herbed white wine sauce truffle oil. I tried the gnocchi recently and it was amazing! Don’t miss out on this one. The Pasta Shoppe’s “American in Rome” wild mushroom gnocchi, with herbed white wine sauce and truffle oil. Photo by Leslie Dinaberg. Also saluting the festival is “I Am Prawns!” at Crocodile Restaurant and Bar at the Lemon Tree Inn (2819 State St.). This prix fixe menu is inspired by the 2009 Italian film I Am Love. Take 1: Bacon wrapped prawns, paired with Rusack Sauvignon Blanc. Take 2: Filet mignon with portobello mushroom demi glaze, garnished with blue cheese, served with grilled vegetables and truffled mac n’ cheese; paired with Qupe Syrah. Take 3: Triple layer chocolate mousse cake paired with Robert Hall Vintage Port. This is well-priced at $35 per person or $50 per person with wine pairings. Give them a call, as reservations are recommended. Enjoy the fest and the feast! Cheers! Originally published in Santa Barbara Seasons on January 30, 2015. The Sideways celebrations continue on this week with a special 10th Anniversary Sign Promotion September 5th – 14th in 100 different locations throughout Santa Barbara County. To celebrate the Oscar-winning film and its impact on the local wine scene, 100 six-foot tall signs featuring Miles and Jack are being placed at locations used in the film and other high-traffic areas around Santa Barbara County. Fans can pose with the signs and then enter their photos to win the ultimate Santa Barbara Wine Country vacation (or staycation for those who are local). Photos must be tagged with #Sideways10 on Twitter or Instagram, or uploaded manually to Sideways10.com/Enter. Each daily winner takes home a copy of the movie on Blu-rayTM + Digital HD, while one lucky Grand Prize winner receives the ultimate vacation in Santa Barbara Wine Country, including four hotel night stays, wine tasting adventures, delectable dining, and ocean and land excursions. Pose with these Sideways celebration signs and you could win big! Photo courtesy Visit Santa Barbara. Sign locations in Santa Barbara include: Au Bon Climat, AVA Santa Barbara, Conway Deep Sea Tasting Room, Grassini Family Vineyards, Kalyra by the Sea Tasting Room, Kunin Wines, La Cumbre Plaza, Margerum Wine Company, Pali Wine Co., Paseo Nuevo, Santa Barbara Public Market, Silver Wines and Wine Cask. Solvang is calling all wine aficionados to participate in the Merlot Taste-Off event on September 13 as a tribute to the movie Sideways. The event pays homage to the wine variety made famous in the Oscar-winning film, when Miles famously says, “If anyone orders merlot, I’m leaving. I am not drinking any (expletive) merlot!” Tracy Farhad, executive director of the Solvang Conference & Visitors Bureau, has a rebuttal. “No more denigrating merlot! 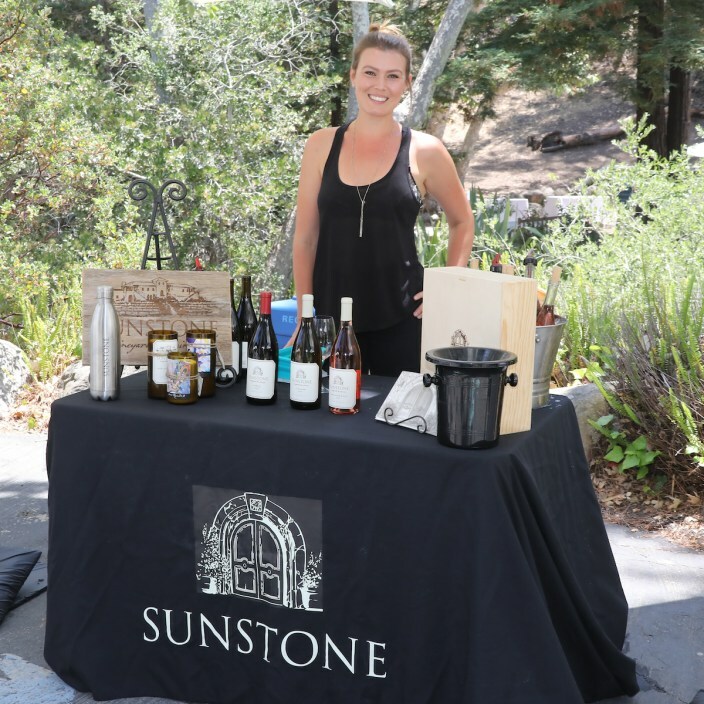 Come taste these marvelous wines for yourself.” Participating wineries include Baehner Fournier, Buttonwood, Carivintas, Core, Dascomb, Happy Canyon Vineyard, J. Ludlow, Lions Peak, Lucas & Lewellen, Point Concepcion, Sagebrush Annies, Sevtap and Sunstone. The event is a benefit for the nonprofit Solvang Festival Theatre (420 Second St., Solvang), which is also, conveniently, where it takes place. For information and tickets call 805/688-6144 or visit SolvangUSA.com. Los Olivos Wine Merchant & Café (2879 Grand Ave., Los Olivos) hosts its first-ever “Rock Steady” Bien Nacido Winemakers’ Dinner on September 18 at 6 p.m. Three of Santa Barbara County’s winemaking elite—Jim Clendenen of Au Bon Climat, Bob Lindquist of Qupe and Trey Fletcher of Bien Nacido Estate—will be pouring their specially paired Bien Nacido vineyard-designate wines with a six-course meal created by Café Chef Chris Joslyn. For reservations call 805/688-7265 ext. 203 or click here. Friendship Center, the south coast’s only nonprofit, fully licensed adult day services program, will have its 5th Annual Wine Down, Friday, September 19 from 4-7 p.m. This casual yet festive event features local vintners pouring their wines for tasting, delicious Asian-inspired hors d’oeuvres by Spices N Rice and live music by Montecito Jazz Project. Held al fresco in the courtyard of the lovely center in Montecito, this Friday after-work gathering will give guests a chance to enjoy a lovely late-summer evening and “wine down“ from the cares of the week. A small silent auction will offer carefully selected gift baskets featuring high-quality wine and wine-related items. Participating wineries include: Andrew Murray Vineyards, Buttonwood Farm Winery & Vineyard, Consilience & Tre Anelli, Cottonwood Canyon Winery, Demetria, Fess Parker Winery & Vineyard, Pali Wine Co., Palmina, Santa Barbara Winery, Tower 15 Winery, and Vinemark Cellars. Beer from Surf Brewery will also be featured. The Friendship Center is located at 89 Eucalyptus Lane in Montecito. To purchase tickets click here. Solvang’s Wandering Dog Wine Bar (1539-C Mission Dr.) has the first “Friday Night Wines” class of the season on Friday, September 5 at 6 p.m. In the September class, guests will learn about the history of Santa Barbara as a wine country, and will sample wines from the five distinct AVAs in the County. Reservations may be made directly through Wandering Dog Wine Bar, by calling 805/686-9126 or emailing jody@wanderingdogwinebar.com. Hope to see you out and about! Cheers! Originally published in Santa Barbara Seasons on September 5, 2014.